After several months of having no wearables activities, there were three in three days this week! 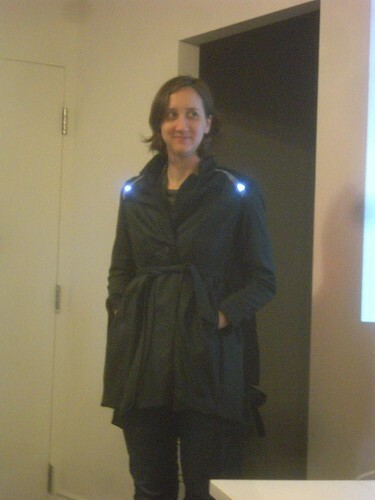 On Tuesday Kate put on Toronto Wearables Meetup #6 featuring Angella Mackey. She talked about the processing of turning her one-off Bicycle Jacket (with illumination) into something that could be manufactured, and all the various challenges she met along the way. It was a wonderful talk about the practicalities of making something more than once, and I really enjoyed it. I've got full notes, email me if you'd like a copy. On Wednesday, Fashioned By Tech, a super interesting networking event for people interested in technology as it applies to fashion. They actually meant things like using the internet to market fashion, rather than my much more specific "wearables", but they really liked my Heart Spark and I had a very interesting time talking with people who are part of the fashion industry. On Thursday, technosapiens was a project showcase for students who took a wearables course at OCAD University, a local arts school. There were a half a dozen really interesting wearable projects on display, and the students were on hand to present and talk about their work as well. I was especially blown away by the Earthquake Skirt, which not only looked like an earthquake, but was also hooked up to the internet, and literally shook every time an earthquake is recorded worldwide. The magnitude of the quake determines how hard the skirt shakes! Seriously disturbing in person, it really does give you the mood of being in a earthquake. 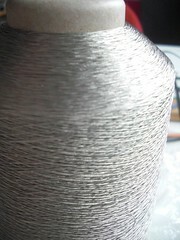 Finally, on Thursday I also received (at last) my big spool of solderable conductive thread from Karl Grimm. This stuff is super amazing, it solders so well, better even than a lot of wires! It's totally gonna solve the fraying problem that is such a killer for so many wearables projects. I have so much (1.2kg! ), I spent a big chunk of today using an ancient Singer sewing machine (so awesome!) to respool some of it so that I can share it with various people who have expressed interest. You can see photos of a lot of this stuff in my wearables flickr set.